Q. Can I fill the low spot in my backyard? Wetlands are protected under state, federal, and local laws or ordinances. A. 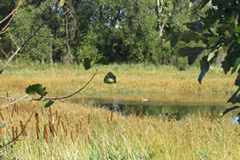 If it meets the scientific criteria as a wetland, you will need a permit under the Minnesota Wetland Conservation Act, and potentially from the Corps of Engineers and local watershed district. Contact the WCD for more information on how to start the permit process. Q. How do I know if it is a "wetland"? A. There is a scientific method that identifies wetlands, and there are many private consultants available to help you with your project. But the WCD can assist with simple determination of whether or not you need a full delineation or need to hire a consultant. Contact the WCD for assistance. 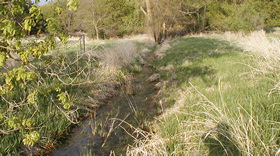 Some examples of wetlands are shown on the wetlands page. Excavations of wetlands may be permitable if the functional value of the altered wetland is higher than the pre-existing condition. Q. Can I dig out a pond within my wetland? You know, "improve" it. A. Excavations within wetlands are an alteration, but not necessarily an improvement. Excavations may be permitable if the functional value of the altered wetland is higher than the pre-existing condition. It is the responsibility of the applicant to provide the information needed to judge whether the proposal will be an improvement. Replacing a grassy wetland with open water alters the functions, but isn't always better for the environment. Reviewing agencies usually request information such as what vegetation is there now; does the wetland receive its hydrology from groundwater or surface runoff; how deep and wide would the excavation be; where will the excavated material be disposed; and how will you revegetate the exposed surfaces. Q. Why do I need a permit to dig out a pond? A. Wetlands are complex ecological resources that provide many benefits to the environment, such as nutrient uptake, wildlife habitat, floodwater retention and groundwater recharge. 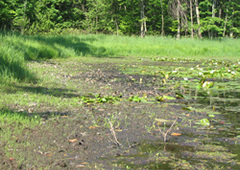 Attempts to create a pond in one of the drier wetlands can disrupt those functions, or have undesired impacts downstream. The permitting process allows for a review of the project and existing conditions. If the project is determined to be an improvement on the landscape, the permit can be granted. Projects that are likely to lose functional value, based upon local rules and policies, will not receive approval. Water levels in wetlands can vary seasonally. Q. My pond always had water in it, but this year went dry. Can I dig it out to get the water back? A. The water levels in wetlands follow local precipitation. Water levels vary seasonally (usually becoming drier in the late summer and fall, and having more water in the spring or after heavy rainfalls), even those that get their hydrology from groundwater. When we have extended dry cycles or drought, even open-water wetlands can go completely dry. Excavation will not get the water back; only precipitation will provide more water. Sometimes excavation can damage the wetland by thinning the sub-surface confining layer, so that it drains away faster yet, sort of like pulling the plug on the bathtub. Restoration of the natural hydrology is encouraged for wetland that have been drained. Q. My wetland has an old drain tile and ditch that drained the wetland. Can I plug the ditch? A. If the ditch is a private ditch (not part of a public drainage system) and the wetland is completely within your property, restoration of the natural hydrology is encouraged. But it is very important that the restored wetland will not flood any buildings or property not under your control, so a land survey may be needed to determine what might be flooded. If the restored wetland will extend onto a neighbor's land, talk with them first to get their permission. Sometimes a partial restoration is possible, to get some open water without interfering with your neighbors. Q. Can I get rid of the ugly weeds that are out there, and replace with more attractive vegetation? A. First of all, you'll need to clarify what plants you are calling weeds, and what you consider attractive. To some people, any plant groups that appear messy or uncontrolled are called "weeds", and that is often the case with native species. Identifying what plants are growing there, and learning about their usual habitats (whether they are truly weeds or native plants) may change your mind on the need to alter the wetland. Many of our local wetlands are ringed with reed canarygrass, an aggressive species that crowds out more desirable plants. Replacing reed canarygrass with a diverse mix of grasses and grass-like sedges can improve the wildlife habitat both within the wetland and surrounding it. Adding wildflowers and shrubs makes an even more dramatic improvement in the value to attract and support a variety of wildlife species. We encourage using native plants for revegetation, to avoid introducing invasive species. Your community (municipality, watershed district, or homeowners association) may have shoreline or buffer restrictions that regulate clearing of vegetation around wetlands. Restoration activities may need to be pre-approved by these entities. Your community (municipality, watershed district, or homeowners association) may have shoreline or buffer restrictions that regulate clearing of vegetation around wetlands. Q. Can I clean out some of the cattails, which have choked out the pond during the recent dry years? A. Removal of some cattails may be allowable, but should be discussed with your local permitting authorities. Often there is a limited size that may be cleared by uprooting the cattails, without an extensive permit process. If your pond or shoreline is regulated by the DNR, an aquatic vegetation management permit will be needed. Q. How can I make a pond in my yard? A. If the area is already a wetland, read the other FAQs on this page. If the area is not wet, your planning will need to address where the water for the pond will come from, and how you will keep it there. The simplest way to achieve a bit of open water is by creating a plastic-lined pond. Many landscape contractors offer that service, or kits are available at many home-improvement stores. Excavation of large basins usually need soil manipulation to seal the bottom of the pond, to hold water. The water that sits in this pool often stagnates, supporting undesirable algae and mosquitoes. But unlike an artificial pool, if an excavated pond is successful and develops wetland characteristics, it will become subject to wetland regulations, including set-back distances and mitigation requirements for further alterations. Q. What if I still have more questions?